One of the first questions that you get from the security folks who will be involved in an Office 365 migration project is the actual location of the organization data. While you can broadly answer the locations as US, EU etc, I am sure they will want a more precise answer. Tech savvy guys will want to know which services are being hosted in each datacentre within a region and that is when it gets complicated for the consultants involved ;) Luckily, Microsoft updates the information and breaks it down ​in a nice map view with a list of Office 365 services that is being hosted from each datacentre. For UK based organizations, there are three datacentres within the UK - London, Cardiff and Durham. You will need to let Microsoft know to move your core data to the UK if it is required for compliance purposes. In order to find out the Office 365 locations within each region and more information around services hosted within each datacentre, head over to Office365 Datacentre Map and select your geographic location. 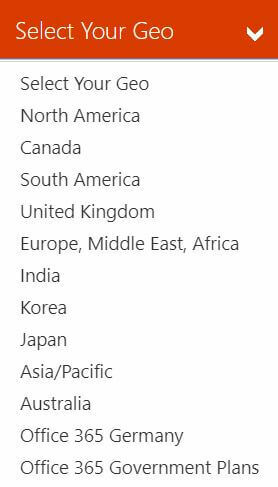 ​For example, if I select Australia as my location, it shows me that there are two Office 365 datacentres, New South Wales & Victoria and both of them host the same services.